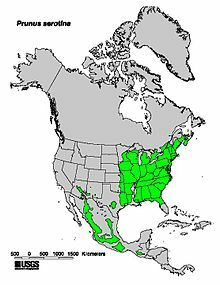 Cherry is found in the eastern half of the United States, from the plains to the Atlantic Ocean and from the Great Lakes to the Gulf of Mexico. It also occurs in high elevations in Mexico. The tree reaches a height of 100 ft (30 m), with a diameter of 4 to 5 ft (1.2 to 1.5 m). It is shrubby under poor growth conditions and at the northern limit of its range. It does best on the rich, moist soil of the Appalachians. The sapwood is light yellow, while the heartwood is brownish with a greenish tinge, darkening upon exposure to a deep reddish brown with a golden luster. The wood has a mild, aromatic scent, but no characteristic taste. It is of medium density, firm, and strong, with a fine, uniform texture. The grain is generally straight. Cherry is easy to work, finishes smoothly, and is dimensionally stable. It is easily machined. It can be sawn cleanly, turned well, and planed excellently with standard cutting angles. Screw-holding ability is good, as is gluing, except where gum streaks are present. Rated as very resistant to heartwood decay. Fine furniture, printing and engraving blocks, patterns, professional and scientific instruments, piano actions, handles, wooden ware, toys, and specialty items.